Last weekend we went to see the new film called Igor. It wasn’t my first choice – I had a secret yearning for High School Musical 3 but my daughter had already seen it. So I went to the cinema with that horrible doubt you get when you’re paying to see a film you’re not really interested in. Igor is the latest of that ever growing list of animated features with famous, busy, okay I’ll do another animated film, actors providing the voices. This in itself is irritating for me; I always hang around at the end as the audience stampede around me for the exit, waiting for the credits to roll so I can check which actor voiced which character. And I feel bad about being such a critic because, well, doesn’t he look cute? Igor shouldn’t be singled out – there are dozens of examples – and I do think that the smart talking animated genre (especially when they’re animated animals – Madagascar 2 is on its way) is screaming out to be laid to rest. In Ratatouille, one of the main plot threads is about a nasty food critic (voiced by Peter O’Toole) who can close a restaurant forever with just one bad review. The other characters in the film are terrified by him, but I found this too much of a knowing joke for children and explaining why the O’Toole character was so feared simply spoilt the gag. And I suppose you can blame Woody Allen a little for voicing Antz, which has lead to countless comedians trying their hand at this sort of thing; Izzard, Jerry Seinfeld, Sacha Baron Cohen and the rest. it can’t be a bad job, unless of course you’re a proper actor like Ian McKellen who didn’t enjoy making Flushed Away that much because it simply tore him away from the contact of other actors. Like hobbits, for example. I shall dutifully see Madagascar 2 when it comes out, and we already have Kung Fu Panda on DVD. I’ll get to see High School Musical 3 soon I hope. And so we stampeded out at the end of Igor, or at least I did after checking the credits to see if it really was John Cleese providing the voice of a minor character. I think it was, although there were too many little heads bobbing in front of me to know for sure. Two years ago, my very first film review here was for Casino Royale, and I mused that Daniel Craig could possibly equal, if not supplant, Sean Connery as the best incarnation of James Bond. After seeing Quantum of Solace I’m still of my 2006 opinion. Craig is still very much the number two Bond almost ready to push aside Connery’s one, which is an unusual stance to take considering that the 22nd Bond film is generally very disappointing. If Craig and Dench are my only terms of reference, I found the Judi Dench presence in this movie somewhat stifling. As M should really only be an incidental character, she’s given too much prominence in the role. M should never really threaten to overshadow Bond, and where Dame Judi should only be giving a cameo she has almost as much screen time as Craig. Dench is everywhere, turning up in hotel rooms, lobbys and lifts, even London East End tower blocks so she can berate our hero in her school mam way. I half expected Craig to open the fridge door at breakfast time to find Dench sitting beside the milk cartons, looking down her nose and muttering try not to make the tea too strong this time, Bond. So picking up from where Casino Royale left off, Quantum of Solace finds Bond still in a state of unrest following the death of love interest Vesper Lynd. The man who he corners at the end of Royale is dragged in for questioning at the beginning of Solace, and the film begins with an impressive car chase (that would have been more impressive if I hadn’t already seen it on a recent South Bank Show). Just when we think we’re sitting down to some comfortable Bond chat there’s another chase sequence, which echoes the opening of Royale for speed and physicality. Here Bond chases a double agent across Italian roofs and ascending (and rapidly descending) a bell tower. It’s very well done, although looking back I think that director Marc Forster played all of his best cards far too early as what follows falls far from expectation. 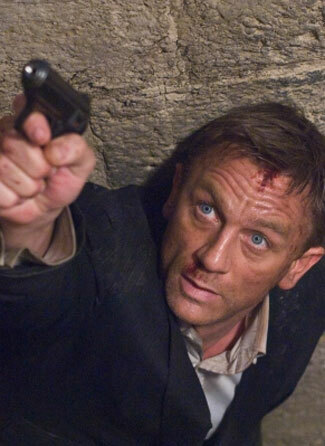 Daniel Craig continues to excel in the role, which makes it all the more tragic that this film is so messy. He’s totally convincing as a man who, if you pick a fight with him then you’re going to lose. If he asks you a question then it’s best to respond clearly and loudly. If he’s sent to kill you then you’re going to die. Craig portrays the ruthless and competent assassin perfectly, best shown where he swiftly disposes of a man in a Haiti hotel room. This is a scene that stretches right back to Connery’s fight with Robert Shaw on the train in From Russia With Love and proving that we still don’t need gadgetry and special effects, just a well coreographed punch up. The only thing that spoilt it for me was the cynical product placement. No, I still don’t want an Omega watch. The makers of this film have claimed that they wanted to dispense with the cartoonish Bond villains of old. Gone are the white cats, metal hands and teeth, and in their place, at least as the film sketches out at the beginning, is the allusion to the modern threat of terrorism, that anyone, however apparently benign, could be a menace – as M grows increasingly concerned that the enemy is buried within her ranks, ready to turn on her when given the signal. There is a watered down villain, and in this villainous role Mathieu Amalric makes the most of what he is given, but it’s obvious that he wants to be a classic Bond baddie, snarl, utter memorable lines and stroke an albino moggie. Small and weedy, he comes across as a greasier and nastier Roman Polanski, which is odd as buried in the mad plot of this film is a distant echo from Chinatown‘s theme of heat and drought. But, like the other themes in this movie, it isn’t explored thoroughly. It’s the plot that ultimately ruins Quantum of Solace, both for the big headed belief that an audience will come with Casino Royale fresh in their minds and for the fact that, for a film that wants to be ground breaking, the storyline is hackneyed and unoriginal. And the stupid title. Seems to be that they only pick titles with a pair of words with o s – Casin o, R o yale, o f and bloody s o lace. Then they can string the two o s together in the title sequence to make 007. So you could equally call it Quantum of Booze or Expresso Bongo. Or Bored by Bond. At least the theme tune, written by Jack White, is very good – even though it uses a few token John Barry references. I still have high hopes for Bond, but Craig’s next outing requires a fresh story and a lot less Dench. Six months ago I read Richard Matheson’s I Am Legend. Around the same time, a new film version of the 1950s novel appeared starring Will Smith. Now I’ve finally seen the film on DVD so I can write a belated sequel to my original post. It’s often quite refreshing to come late to films. I Am Legend received mixed reviews, at least I remember it doing so. There’s also enough time passed after reading the book to prevent me from comparing it too closely, and it’s years since I’ve seen the 1970s cinema adaptation The Omega Man starring Charlton Heston. I Am Legend is no Omega Man, although it’s not really I Am Legend either. It is nearer to the three great science fiction virus-disaster movies of recent years 28 Days Later, its follow up 28 Weeks Later and Children of Men. It’s not as good as any of them, but I was pleasantly surprised nevertheless. Firstly, Will Smith has improved tremendously as an actor. Thankfully he has left the jokey persona seen in Independence Day and Men in Black at home. Age is on his side, and the grey-stubbled Smith shows some real promise now as an actor. Secondly, it looks like brainstorming sessions in the movie planning stages quickly concluded that, whilst Matheson’s novel is a great piece of sci-fi writing, audiences have moved on. So talking vampires just don’t wash any more, and abandoned post-apocalyptic cities full of slobbering nasties has been done to death in the cinema, so be careful. The vampires, prominent in Matheson’s novel, therefore don’t take centre stage in the new film until way into the story. Instead we see the empty city, shoulder high grass and prowling wild animals. Fittingly, all of the same things seen in a recent Channel Four documentary that attempted to predict how our cities would look if all the people abandoned them. Add to this Smith, proving he can act quite well as the last non-slobbering man on Earth, although he is almost acted off the screen by a very good, semi-slobbering, Alsatian. Perhaps I Am Legend could be criticised for attempting to pull all of the right emotional strings. Lovely dog. Lovely dog dies. Cute family glimpsed in flashbacks. Shop dummies to highlight Smith’s loneliness (although providing a good plot device). The radio message broadcast to the empty world. Smith, away from human contact for so long, talking in sync to a DVD of Shrek. And so on. Perhaps it just caught me in the right type of mood. But I enjoyed it, and if I now went back to revisit The Omega Man I might judge this the superior film. I’ve had something of a love-hate relationship with David Cronenberg over the years. The Brood, Scanners, The Dead Zone and The Fly are all great films but I found myself distanced from his later work. It wasn’t that his films were too sickening in their content, I just got sick of Cronenberg wandering into pretentious and unfathomable territory. Dead Ringers, Naked Lunch and Crash didn’t press the right buttons for me. Lately, however, Cronenberg has moved into a new phase of film making. It started with Spider, an unfairly ignored film starring Ralph Fiennes as a disturbed man living in London. The director appeared to be moving away from surreal, experimental and gut-churning imagery to something more naturalistic (although no less disturbing). 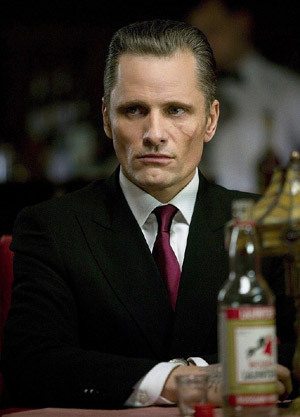 This continued with the excellent History of Violence, starring Viggo Mortensen as a man haunted by his ugly past, and Mortensen and Cronenberg have recently collaborated again on Eastern Promises, with the actor being Oscar nominated for his performance. Approaching Eastern Promises by heralding a new, mature phase for David Cronenberg was an unwise thing for me to do. Unfortunately the film was a disappointment, leaving me particularly baffled as to why Mortensen has been praised so much. London is criminally underused as a setting, and the tale of Russian gangsters is totally unconvincing. Even the already much celebrated fight scene, where Mortensen fights off two would be assassins in a steam room, is incredibly overrated. Naomi Watts appears unsettled as the young English nurse drawn into a dark and violent underworld, and many of the supporting actors are miscast and consequently unbelievable. But Eastern Promises does feature many Cronenberg stamps, where his individual style of film making shines through, and where you think this could only be David Cronenberg. There are some very subtle touches throughout; a new born baby really does look new born, blood soaked and alien to the world. Later this contrasts chillingly with a wasted prostitute, curled into a foetal position. And when he does use London effectively as a backdrop it is very memorable. The dead body washed up by the Thames barrier is one such scene, framed with macabre precision. The best things are all visual, and Eastern Promises makes it clear that Cronenberg doesn’t work particularly well with actors, so when he does settle down into plot and characterisation he fails. Eastern Promises is therefore an oddity, a new phase for Cronenberg indeed but one he’s not altogether comfortable with. Part of him wants to experiment with the horror genre and part of him, I suspect a much smaller part, wants to make films like this.